She is known for playing the formidable family matriarch, Eleanor Young, in Crazy Rich Asians. 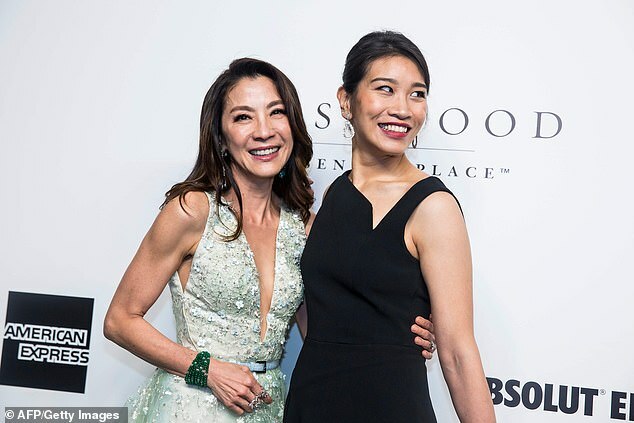 But former Bond girl Michelle Yeoh, 56, displayed her more delicate side as she returned to the city were her career was launched. Displaying a mint billowing gown with an embellished netted overlay, the actress looked sensational as she showed off her toned physique at the amfAR fundraising gala in Hong Kong on March 25. As the actress walked across the emerald carpet, she displayed her age-defying figure with a full-length low cut dress and a sky blue belt around her slim waist. The Malaysian actress let her brunette tresses rest gently on her shoulders as she posed in front of the camera’s at the annual black tie event. The natural beauty paired the look with a chunky white watch, an emerald bracelet and dazzling earings. Looking as radiant as ever, the former Miss Malaysia and amfAR Ambassador completed her look with a touch of rouge on her cheeks and a swipe of mascara to her lashes. The event, which is now in its fifth year, sees stars come together to help raise money for HIV and AIDS research. This year the gala honored Hong Kong businessman and renowned entrepreneur and Adrian Cheng who is the executive director of company New World Development. The actress first hit the public eye after winning the Miss Malaysia title at the age of 20 in 1983. The star then turned her talents to acting when she hit the screens alongside Pierce Brosnan in the James Bond classic Tomorrow Never Dies in 1997. Last year, the Hollywood star, who always plays the fierce matriarch Eleanor Young in Crazy Rich Asians, praised the drama’s success and shared how she would not endorse Asian stereotypes on screen. Previous articleFilming On “Bond 25” Quietly Underway?